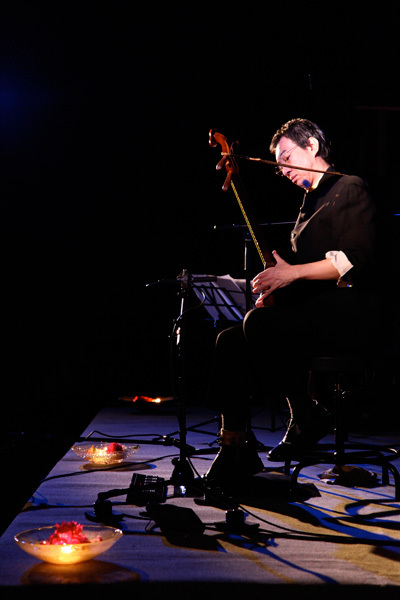 Qin ch'in, a Chinese ancient stringed instrument, is so unique that its professional players completely disappeared even in its home country, China. When I was an electric bass player about forty years ago, I happened to meet this instrument at an antique market like a revelation. I didn’t know even its name, besides it was almost moldering. However it somehow impressed me, who was looking for other instruments to express myself straighter with. And it has become exactly a lifelong companion for my music life afterward. I knew well that it wouldn’t be so easy to play“Qin ch'in” even if I was a professional bass player. I didn’t think I, Japanese could express Chinese spirit or heart with Chinese instrument, nor had an instructor to teach me. Then I looked on this Chinese ancient instrument of“Qin ch'in” as an universal one. I tried to bring out its tone color and to sound it as much as I could. I decided to create music based on my Japanese sensitivities. I fixed it and did all kinds of things for playing and tuning it. I chose types and sizes of strings. I composed music, too. I’ve created everything by myself including its sound using different effecters. I released my first CD (in those days it was a record, though.) some twenty years ago. I got a chance of working for theme music on the late Tetsuya Chikushi’s (leading journalist) TBS radio news program, which brought me opportunities to take charge in music for a lot of dramas afterward: NHK’s period drama “Takeda Shingen” in 1988, and composing and playing music for NHK dramas of “Kura”, “Shun-to” and “Kai”. I also worked for the stage performances of “Kaijin-bessou” starring Tamasaburo Bando (Kabuki-actor), and “Midsummer Night’s Dream” starring Shoroku Onoe (Kabuki-actor). I’ve released 15 works including one DVD. “Qin ch'in” that I have been playing is just the one I found some thirty years ago: in other words, this is the only one I play in my performances. Copyright ©2009-2019 Aki Fukakusa All rights reserved.